$6.35 SALE Remove stains and odors easily with non-toxic, eco-friendly Bac-Out. A must for pet stains and smelly cloth diapers. Made with lime peel extract which cuts grease and disinfects. 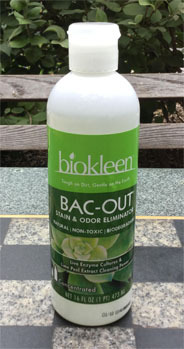 Diluted with water, Bac-Out is a general odor neutralizer in kitchen and bath. Pleasant lime scent. No overpowering fake, chemical smell. Safe around children and pets. 16 oz. Contains no phosphate, chlorine, ammonia, petroleum solvents, alcohol, butyl, glycol ether, SLS or SLES, EDTA, DEA. No SARA Title III, CA 65, or EPA priority pollutants. No materials listed by the ACGIH as hazardous.